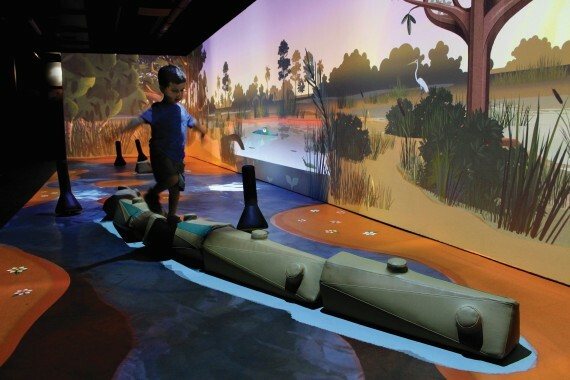 The interactive River of Grass virtual reality exhibit is a large room stuffed from floor to ceiling with technology to give young children and their parents the experience of a fully animated interactive day in the Everglades. Targeted at preschool kids, the immersive interactive experience provides a host of playful interactions within the virtual environment to stimulate understanding of Florida’s precious wetland ecosystem. Using 16 projectors and 7 networked motion detectors to control procedural animations in the custom C++ 3D application, we believe we pushed the boundaries of interactive environments in museums. Exploring the space, young visitors experience the differing lighting conditions as time progresses from dawn to dusk and through the night, meeting the animals that are active during these time periods. Each animal has its own distinct personality and interactions, reacting to the movement and behaviour of the children. Children and their parents can also affect the water flowing through the tunnel by using the log props provided to dam up the river beneath their feet. These actions visibly affect the plants and animals down river and teaches young visitors about water dynamics in the Everglades. Children also get the opportunity to learn about weather dynamics and witness the pertinent changes that happen over the seasons as they progress through the exhibit. Finally, at the end of the virtual reality exhibit experience, the young visitors can make use of the torch props provided to light up the night-time view of the Everglades and spot animals they would not otherwise be able to see. Since we design for pre-primary kids at the age of 3 to 6 years old, we had to understand very well how people of that age interact with their environment. We decided to build our interactions around common play and game mechanics or our audience, e.g. chase, hop scotch, or role play. One of the main challenges was to find a good balance between scripted and explorative experience. Kids at this age play with almost everything, yet, our goal was to get them involved in very specific interactions with specific outcomes. Each step of the design process involved user research and testing. Already the initial selection of animal protagonists was based on preferences of the target audience, research that was done by the museum. Once we considered a specific game mechanic or interactions, we came up with rough prototype and tested with kids. An interesting example of an unexpected outcome of testing is our giant flash light. We were looking for a physical prop which would be recognised by kids as a pointing device to cast light onto the screen. We would simply expose kids to these objects and observe what they would do with them in the context of night time. Our giant flash light, although a very stylised shape worked immediately. Our client initially wanted a smaller device, but we were able to proof to them, that this worked.